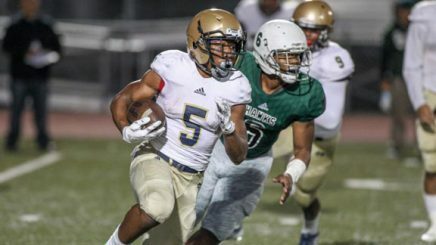 One of the best running backs in the state of California the last three years has been C.J. Verdell of Mater Dei High School in Chula Vista. An all-state first team running back in California (Cal-Hi Sports), Verdell put together an impressive high school career including back-to-back 2,000-plus yard rushing seasons according to MaxPreps. In all, he rushed for 4,855 yards and 64 touchdowns, adding 10 more touchdowns as a receiver. Verdell is a short, thick kid with the classic running back build. He has been listed by most media sources as 5’9″ and weighing between 190 and 195 pounds. ESPN’s football recruiting page lists him at 190 pounds, while Andrew Nemec of the Oregonian states that he is 195 pounds. I have seen no evidence that Verdell ever participated in any sanctioned events where his height, weight and speed were verified. His Hudl.com tape states that he runs the 40-yard dash in 4 ½ seconds and again, this is unverified. However, based upon the tape that I have seen, I don’t believe that the 4 ½-second clocking is a reach. He appears to have plenty of speed (and wiggle) for the position. C.J. 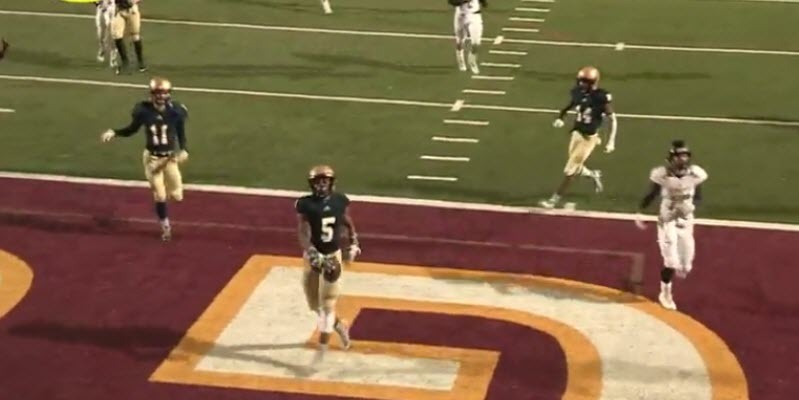 Verdell demonstrates an impressive skill set with a blend of power, balance and speed that reflects the nearly 5,000 all-purpose yards he accumulated at the high school level. He has a nice change of direction at nearly top speed. He powers through chaff, with a nice forward lean at the line of scrimmage, and breaks arm tackles with balance and quick feet. Though he was primarily a running back, they did throw to him some also. He demonstrates a limited route tree and the routes he ran were primarily wheel routes and some screens. He catches the ball away from his body and doesn’t fight the ball. He flashes his athleticism with ease as he catches the ball and puts it away without jumping in the air at the moment of reception. In the video above, a tackler doesn’t wrap Verdell up in an attempt to get him on the ground. Verdell uses his great sense of balance to power through the tackle. However just wrapping up is sometimes not enough. Verdell demonstrates an amazing sense of balance to shake off a tackler even when the guy did do a pretty good job of getting him on the ground. In the clip above, Verdell uses the whole left hash mark side of the field on his way to a touchdown. Many of his clips show him exploiting cut-back lanes that encompass both hash marks. He is a natural cut-back guy. He has the vision to see these lanes open and close, then the athleticism to break into these seams for big plays. Though he does not appear to be able to make second and third level changes of direction at full speed, he does demonstrate noticeable acceleration from these cuts. This skill will result in third-level defenders misjudging the cut-off angles to him in the open field. Verdell appears pretty polished at running these wheel routes out of the backfield. He doesn’t fight the ball and catches it in stride. Dalvin Cook who was taken in the second round of the 2017 NFL Draft (No. 41 overall). Cook was a workhorse running back at Florida State following a stellar high school career in which he rushed for 4,267 yards and 64 touchdowns. His high school productivity is nearly identical to C.J. Verdell’s totals in terms of yards and scores. Though both of these guys are of similar build and speed, I’m of the opinion that Verdell may have just a little more “wiggle” to his skill set than what Cook demonstrated in high school. Cook’s draft profile provides a little insight on his skill set and its similarity to Verdell. Though Dalvin Cook appears to be more of a “one cut and gone” guy as opposed to C. J. Verdell (who has more wiggle in his game), they’re pretty similar running backs from a skill set perspective. Here, Cook demonstrates his great balance after contact. Both Cook and Verdell have exceptional balance and are elite at staying on their feet. C.J. Verdell has the ideal compact frame for the running back position. At the first level, he demonstrates the ability to get “skinny” on dive and power plays between tackles. He is relentless in staying upright due to a great sense of balance, power and quick choppy feet. At the second level, he flashes the cut-back ability and vision to find the seams. At the third level he has excellent speed and the “wiggle” to make cuts at top speed to defeat the angles of back-end defenders. Verdell is a solid running back with a “home run hitter” skill set. His balance and cut-back skills are elite. He should see the field early in his collegiate career and has an NFL future after college.